SIX STAR PRO SOUND & LIGHTING has more than 20 years of experience in the Electronics Industry and has been selling Disc Jockey (DJ) gear for over 15 years. 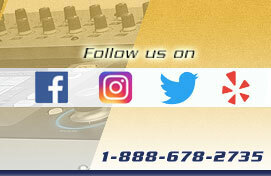 Currently, SIX STAR PRO SOUND & LIGHTING is a thriving online superstore for DJ equipment, Pro Audio & Lighting products. SIX STAR PRO SOUND & LIGHTING is also a large facility business in downtown Los Angeles, California (CA) with over 20,000 SQ feet of space. The SIX STAR PRO SOUND & LIGHTING staff have extensive experience in Internet, mail order and retail Technology and many years of experience in customer service. SIX STAR PRO SOUND & LIGHTING offers a large variety of goods, including DJ mixers, Amplifiers, Speakers, CD players, Turntables, Processors, DJ cases, DJ Lighting, Intelligent lighting, Accessories & much more. The blend of merchandise is designed to fit every DJ and every budget. Plus, the selection is constantly changing. New items are constantly being added, and special deals are offered regularly. Thanks for taking the time to read about us. We look forward to doing business with you. SIX STAR PRO SOUND & LIGHTING has more than 20 years of experience in the electronics industry and has been selling disc jockey (DJ) gear for over 15 plus years. We are currently a thriving online superstore for DJ equipment, Pro Audio & Lighting products. We house our products in a large facility in downtown Los Angeles, California (CA) with over 20,000 SQ feet of space. Our staffs have extensive experience in Internet, mail order and retail and many years of experience in customer service. We offer a large variety of goods from DJ mixers, Amplifiers, Speakers, CD players, Turntables, Processors, DJ cases, DJ Lighting, Intelligent lighting, Accessories & much more. The blend of merchandise is designed to fit every DJ and every budget. Plus, the selection is constantly changing. New items are constantly being added, and special deals are offered regularly. Your use of sixstardj.com website and catalog is governed by the policies, terms and conditions set forth below. Please read the following information carefully. By using this website and catalog or submitting an order for products or services, you indicate your acceptance of, an agreement to be bound by, the terms and conditions set forth below. If you do not agree to these terms and conditions, you have the right to avoid shopping with us. Nevertheless, sixstardj.com is obligated to your satisfaction, as a client and will do every thing in our power to serve you and comply with your wishes. These terms and conditions may be changed by sixstardj.com. at our discretion. It’s your responsibility as a user to periodically return to this page to review the terms and conditions for amendments. The amended terms shall take effect automatically the day they are posted on the website and catalog. Continuing use of our website and catalog for shopping with sixstardj.com will constitute agreement to such amendments. Orders received after 12:00PM PST will be processed the next business day. Merchandise in stock will usually ship with in 48 hours of order receipt. We do not collect sales tax on purchases except for California residents. An 9.75% sales tax will be added to your purchase. We do not accept orders to ship internationally nor do we accept orders paid using international credit card. We accept PayPal, Visa, Master Card, American Express, and Discover, with verified or confirmed shipping address. For your protection, orders are sent only to the billing address of the cardholder. Special arrangements may be made for orders that need to ship to an alternate address (please check Address Verification Section). Credit cards are not charged and orders are not processed until your order is ready for shipping. Checks, Cashier Checks & Money Orders: Verified Cashiers checks and United States Postal Service money orders are shipped immediately. Other money orders, cashier’s check, personal and business checks are held for up to the time it clears. Any details provided may be checked for their validity to prevent fraud. If we suspect fraud we may prosecute to the full extent of the law. Layaways are applicable for walk-in customers only. Address Verification is a precautionary measure we perform to ensure both our safety and avoid fraudulent activity. The nature of online shopping does not allow us to do a traditional form of identification, such as a driver's license for a standard brick & mortar store. Instead we conduct address verification through your credit/debit card issuer to confirm your identify and verify the validity of your purchase, ultimately protecting your credit and privacy. If you wish to ship to an address that is not your billing address, you can contact your card’s issuing bank and have your shipping destination added as an authorized alternate ship-to address on your account or on the memo field. We will contact your card issuer to verify this information after you've placed an order. Please allow an extra day to verify any alternate ship-to address. Both your billing and shipping addresses must be verified before an order will ship. If you encounter any trouble when attempting to add an alternate shipping address, let the card issuer know that you are placing an online order and that the retailer must verify your personal information before shipment to eliminate the possibility of fraud. Then, simply give us a call at (888) 678-2735 to let us know and we will re-attempt address verification to complete the processing of your order. Orders with the same billing and shipping address are more likely to ship right away. Errors on our listing (description, price, etc.) will be corrected as it is discovered. We reserve the right to amend any inaccuracies, cancel any order, and void any published offers including those discovered after submission of an order. In some occasion merchandise needs to ship from the manufacturer or from a different warehouse straight to your shipping destination. Please allow an additional 48 hours for it to process and ship. If a product you have ordered is backordered or not available for shipment, we will notify you as quickly as possible via the email address in your order. Anticipated delivery dates for backorders, special order and or custom order items are dependent upon our suppliers and other factors beyond our control, and are subject to change. We will make all reasonable efforts to meet such deadline but cannot guarantee on time delivery and cannot be held liable for it. For both our protection, packages are delivered only to addresses that verifies with your issuing card’s record. We will not hold responsibility on lost or damaged shipment. Packages damaged on transit or lost on transit: You may file a lost package or damage claim with UPS within 48 hours and contact us right away. We ship using UPS services and UPS does not deliver to PO Boxes. We would request you to give us a physical shipping address (subject for verification) for delivery. Weekends and holidays do not count for UPS GROUND, UPS 3 DAY SELECT, UPS 2ND DAY AIR and UPS NEXTDAY AIR. Please refer to http://www.ups.com for more information. Packages shipped using UPS GROUND will take 2 – 10 business days depending on the shipping destination is at. In some occasion the products ordered which is to big/heavy for UPS to safely handle and will be shipped through a freight/trucking company and charged by the pallet. Extra charges may apply. Shipping charges does not include service charges and fees incurred during delivery such as and not limited to forklift charges, liftgate charges, labor, customs, etc. Occasionally we offer "FREE SHIPPING" on selected items chosen. Free shipping offer is good on credit card or pre-paid purchases only and only on the selected "FREE SHIPPING" items shipped to the 48 contiguous United States. Our Free Shipping offer is for UPS ground only. Some states do not qualify (ie. AK, HI) for free shipping (ground) and must be shipped via AIR. Additional shipping charges will apply. Tracking numbers are automatically emailed to the email address you provide. In some occasion merchandise needs to ship from the manufacturer or from a different warehouse straight to your shipping address. In this case tracking numbers will not be automatically emailed to you. You can request it from us but please give us time to get your tracking number as it is not automatically available. All sales are final, make sure you buy the right item the first time. Absolutely no returns for cash or credit card refunds, even if the purchase was made the same day. Returned merchandise is for exchange (within 7 day only) or for store credit (good for 30 days) and must be accompanied with the original sales receipt. (20% restocking fee will apply for exchanges and store credit) Any returns for exchange after 7 days will not be eligible for 20% restocking fee. A proper decision will be made at the time of return. All returns must have return authorization. Any merchandise sold as-is, special order or layaway cannot be returned for any reason. All return items must be in original conditions including all boxes, packaging, instructions and warranty cards. Customer must cover shipping cost for all packages going back to us. There are NO REFUNDS or CREDIT on any shipping charges. Shipping cost that we pay to ship “Free Shipping” items to you is not refundable or exchangeable. For example, if you order a "FREE SHIPPING" mixer for $150 and it cost us $20 to ship it to you, and you decide to return it for exchange for any reason, you would only receive $130 of it in store credit plus the 20% re stocking fee which ends up to be $104 which you could apply towards your next purchase. Sixstardj.com does not offer price protection or price guarantee of any kind nor do we participate in any 30 day return or refund policy. No returns or exchange on opened products, used and refurbished merchandise, Light bulbs, all fluids (fog fluid, bubble fluid, etc.) stylus and cartridges, cables, headphones and earphones (due to health and sanitary regulations), wireless and wired microphones (due to health and sanitary regulations), raw speakers, tweeters, cases, racks, light stands, trussing, speaker stands, bulk products, computer software, computer related products, novelties and accessories. Special order and layaways are considered sold merchandise. All layaways and special orders must be picked up within 60 days. No refunds or exchanges on special orders and layaways. We reserve the right to cancel or delay any order without notice at our own discretion for any reason including: unverified or erroneous billing, 3rd party shipment not affiliated with the cardholder’s details, offensive or unprofessional response from any of our clientele, or the merchandise ordered was discontinued. Any order not able to verify, process, item not available or discontinued within 3 days automatically without notice. Sixstardj.com reserves the right to refuse service to anyone. All products carry manufacturers/factory warranty only. We do not offer store warranty of any kind. We are not responsible or liable for user error. Any user error will void factory warranty automatically. We do not offer any price protection or price guarantee of any kind nor do we participate in any 30 day return or refund policy. We will ship your defective item to the manufacturer/ factory for all warranty and non warranty repairs. Please allow 3-6 weeks for return from manufacturer/factory. Customer is responsible for all shipping charges and any other charges. Customer can send the product to the manufacturer/factory for a faster response and turn-around. Any non warranty item to be repaired will require a $35.00 service and handling fee plus the repair charges. All repairs have to be picked up with in 30 days. After 30 days it will become the company’s property. No claims can be made thereafter. There is no warranty on the following items and cannot be returned for any reason. Light bulbs, all fluids (fog fluid, bubble fluid, etc.) cartridges, cables, headphones and earphones (due to health reasons), wireless and wired microphones (due to health reasons), raw speakers, tweeters, cases, racks, light stands, trussing, speaker stands, bulk products, computer software, computer related products, novelties and accessories. For computer related issues please contact the manufacturer for technical support. For price beating and price matching, Sixstardj.com requires a proof of product in stock, the price in print on the stores or company letterhead, (No E-mail) and must be sent to us by fax. The other business must be an authorized dealer for that product. Sixstardj.com requires a written letter on the manufacturer’s letterhead stating that the company selling their product is an authorized dealer and reseller. We must receive the letter by fax or mail only (No E-mail). The product has to be brand new in a factory sealed box, it cannot be refurbished, b-stock, rental or demo item. Keep in mind that buying from an unauthorized dealer voids your warranty benefits. Sixstardj.com will only beat or match the price at the time of purchase, not after the sale. Sixstardj.com does not participate in any price guarantee or offer any price protection of any kind or any 30 day return policy. The use of name brands shown & used on this website are merely used to identify product only which we lawfully purchased and are willing to sell and are not making any other representations. Any purchase from us constitutes that you, the customer understands our policy and agree to them with no exceptions. All products advertised on the website, catalog and store are brand new factory sealed models, unless otherwise specified on our products page. Sixstardj.com does not offer any store or extended warranty of any kind. We will gladly ship your defective items that are under warranty to the manufacturer for you. There will be related shipping charges which are not covered under warranty. Customer is responsible for all related shipping charges. For any non warranty repairs there will be a charge for parts, labor, any other charges applicable plus all shipping charges. There is no warranty on: light bulbs, fluids and juices, cartridges, cables, headphones, cases, racks, lighting stands and any other stands, novelties, bulk products, raw speakers, tweeters, slip mats. These items listed may not be returned for any reason. Any merchandise sold as is may not be returned for any reason. Throughout our website and catalog you’ll find some items that have prices and some do not. We try to put prices on every item, however due to price changes so often it is impossible for us to print the lowest price. If there is an item in our website or catalog without a price, call, fax or e-mail us to find out the current price. If you don’t see what you’re looking for, it doesn’t mean we don’t have it, we probably have what you need or we can get it for you and give you the lowest price possible. Six Star DJ®, 6 Star DJ®, sixstardj.com®, 6stardj.com® is a registered trademark of SIX STAR PRO SOUND & LIGHTING. Copyright © 2009-2018 SixStarDJ.com® SIX STAR PRO SOUND & LIGHTING - All rights reserved. All brand names shown are all trademarks of their respective companies. No relationship to Sixstardj.com is implied. Sixstardj.com cannot be held responsible for any typographical errors in specifications, pricing or price changes. Some images were created exclusively for Sixstardj.com Reproduction of these photos, drawings, text and or images may not be reproduced photographically, electronically, or by any other means without the express written consent of Sixstardj.com All images are for illustration purposes only. Actual specifications, weight, and prices of the products shown may and are subject to change without notice. While we do our best to check for errors, mistakes may occur. Terms, conditions and Prices are good until superseded by subsequent publications. Any purchase from Sixstardj.com constitutes that you the customer understands our policy and agree to them. Website pricing, Shipping Rates, Items specs Terms and Conditions are updated and changed on daily basis without notice. These terms are NOT negotiable and if you place an order by phone or web you are bound by them whether you "saw them" or not (CA state law & our lawyers say so). These terms are subject to review and can be revised at any time without any further notice. For those of you reading these terms & conditions in our catalog, the best place to see the latest terms and conditions is online at http://www.sixstardj.com/info.html.